On Sunday 28 April we are doing things a little differently. This year we are repeating our successful fish and chip supper, from 7pm on Thursday 18 April 2019, in the Old School Hall. Tickets are £4.50. If you missed the Christmas party yesterday, you really missed out! A huge thank-you to everyone who put together some shoeboxes for our annual appeal. 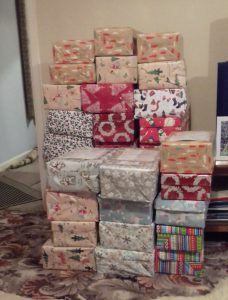 We had 28 boxes in all this year, which will be sent to Eastern Europe via Link to Hope. If you’ve missed out, I’m afraid you’ll have to wait until next year – keep your eyes posted on the notices for more information. 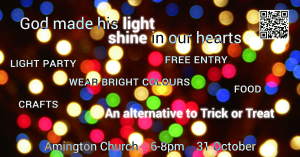 Come and join us for a celebration of light instead of darkness!